Hip Baby Blog: The ultimate cleaner no one knows about! The ultimate cleaner no one knows about! 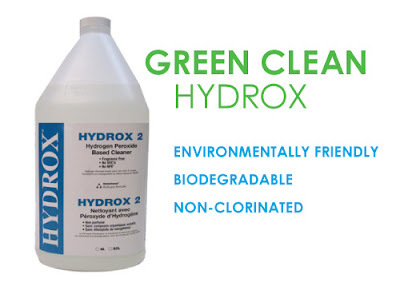 We've been selling Hydrox as the best solution for washing cloth diapers since we opened our doors but when you realize how effective it is as a general cleaner it suddenly becomes indispensable in your home. Works great on all workout gear and is especially effective on kitchen cloths and towels, even gets out that classic dish towel smell. Just fill up machine with water and about 1/4 a cup of Hyrox (adjust according to load size and machine) and let the towels soak for about 30 minutes, then run a cycle. We've even use diluted versions in a spray bottle on carpet stains, floors and even on car seats. And for cloth diapers, there is simply nothing better. Hyrox is colourless, odourless, and leaves no residue on garments. And most importantly it won't hurt the environment because it breaks down to water and oxygen yet remains a strong disinfectant; it's antibacterial, antiviral and kills mold and mildew. Think bleaching agent without the harmful bleach. Need we say more? And now you know about it too!